An educational tour linked to the sea for students that refers to Itinerarium maritimum,inspired by an itinerary drawn at the time of Caracalla by an anonymous author. 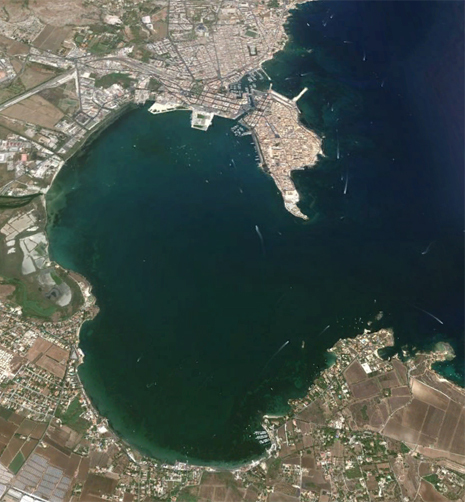 It aims to constitute a reference point for the sea use all around Ortigia island and the port. It helps steudents to be aware of the historical and artistic heritage of the sea related to a specific geographical area. In particular our activity is to provide the students with the historical dimension and artistic value of the glorious past that has distinguished Syracuse over the centuries. Tools and interpretative keys will be provide to understand the different historical phases that characterized men activities in relationship with the sea from the prehistoric times till today. 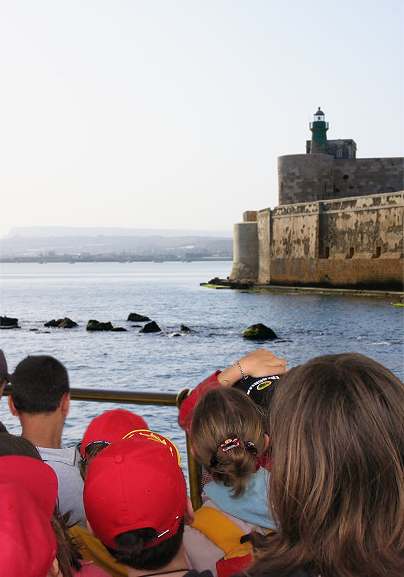 Organize and test extracurricular tours to develop confidence on topics related to the sea and in particular to the maritime history of the ancient Mediterranean; improve the awareness of the historical and artistic needs along the coasts of Syracuse. Elaborate a model of information on cultural issues related to the sea and the ancient navigation;acquire necessary and essential tools to value cultural elements that characterize the city of Syracuse and the sea through the direct visual interaction with sites and monuments;identify the main potential information of the Porto grande and evaluate strategies for enhancement,preservation and protection of the resources; approach to new skills related to the study, research, appreciation of historical and artistic heritage of naval and maritime history,underwater archeology of the ancient Mediterranean. As it happens in Paris, London or Vienna, but in an extraordinary brilliant landscape thanks to the mediterranean sun, you can enjoy mini cruises in the suggestive panorama of Ortigia island,rich of myths and legends of Arethusa’s town, Syracuse described by Cicero as“ the greatest Greek city and the most beautiful of them”. The mini cruise can let you re-experience the most important historical phases of Syracuse , when it was one of the major powers of the Mediterranean world: from Ancient Greek’ arrival in 733 BC to the Arethusa myth, from the late 5th century BC when Syracuse defeated Athens during the Peloponnesian War, from the Normans in 1085 to the built of Castello Maniace(XIII century) by the Emperor Frederick II in the southern end of the island. The Porto Grande (large) consists in a natural bay in the south coast of Ortigia island ,between Punta Maniace and Punta Castelluccio.The distance between the two points is equal to mt 1.080.The circuit described from the coast inland-port is 10,170 m, while the body of water therein has an area of 6,500 square metres approx.The main sector of ordeal consists of twenty spirants from the 1st and 2nd quadrant. It was in 734 BC that the Corinthian landed on the island of ortigia, drove away the indigenous people and founded the colony of Siracusa.In 413 BC the famous battlebetween Syracuse and Athens took place during the Peloponnesian War,from which Syracuse was victorious.Thanks to Tucidide we know on that occasion 200 ships were engaged to fightand the port possessed their own war’arsenals.The port had a particular mooring system with wooden stakes driven into the fund .For their construction some divers were called for the first time for a military purpose.